I am not proud of the aprons I ran up last weekend. The patterns were drafted with just a few guessed measurements. 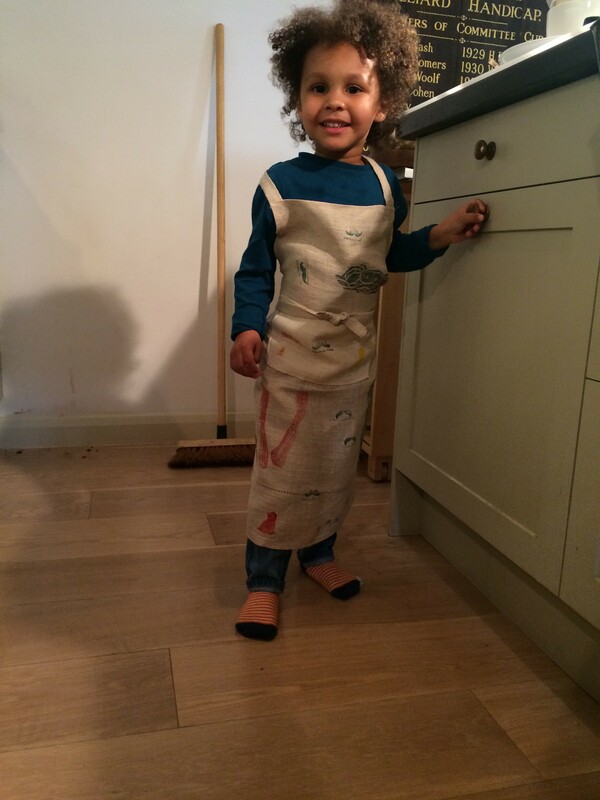 The idea was just to produce a surface on which I could help Ted to print his own apron. 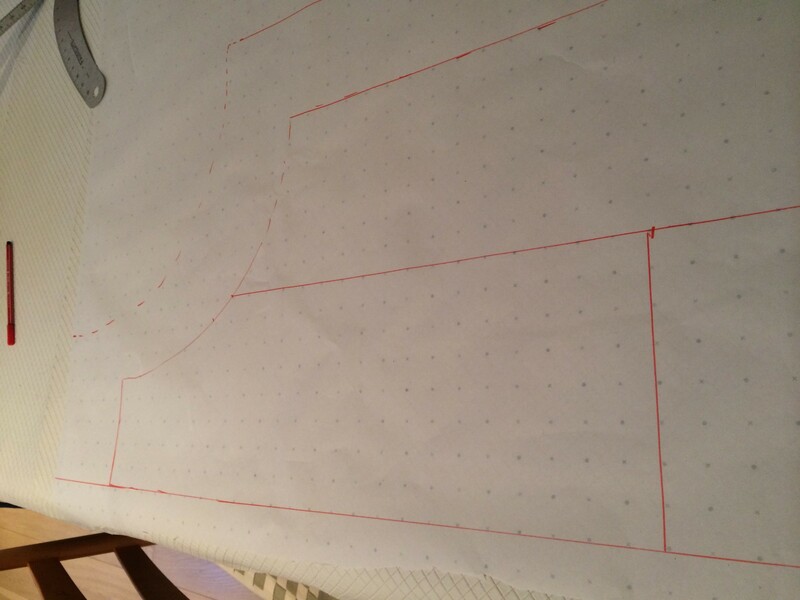 I drew out a man’s, woman’s and kid’s apron shape on pattern paper, (one for Daddy, Mummy and Baby Bear) and used the one pattern to cut just two aprons – the man’s and a child’s. 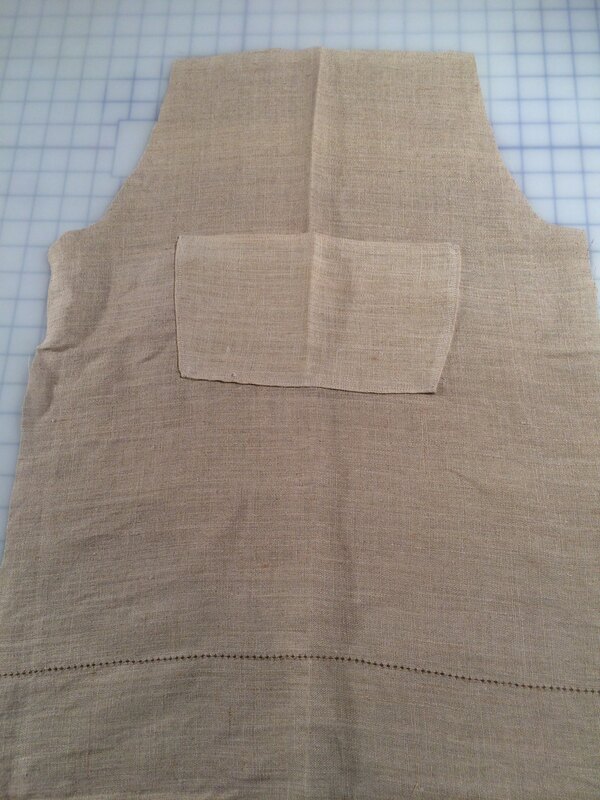 The issue with apron design is that the neck hole needs to be big enough to get over the head, but if it is too big the bib of the apron droops. I used the same old Ikea linen curtain that I got at the Oxfam shop that I have used for toiles before. I cut out a pocket, and used the decorative edge of the curtain for a border. This one is for Ted. I did a similar one for Nick. 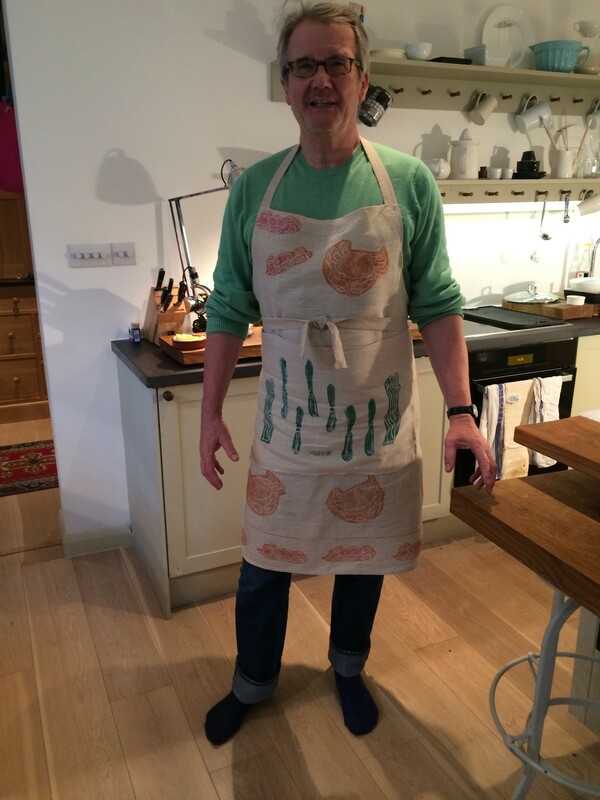 Then we got out all my lino prints and some letters and other oddments and Ted decorated his apron using first red ink and then dark green. Ted put a crab, some seaweed, three knives, several small moustaches, a red dog and a yellow dog, a range of graphics and a finger print. I printed Nick’s apron using the crabs and seaweed that Nick’s daughter Charlotte made for him, and my knives. I also printed the apron with his name. I divided the pocket into three sections for Nick as he wanted specific pocket slots for his scissors – which he is forever losing. Once the printing was complete I hemmed all the edges and sewed on waist and neck ties. Then the cook and his young assistant made a danish twist and a small apple pie. And jolly delicious they were too. Nice idea – I will have to do this with my little ones. Are you still having blog problems or do you want us all to turn sideways to see the pics? I think if you taper the bib part more you will overcome the neck problem easily. I usually use old aprons for my pattern. Honestly, you blow my mind with everything you do. The printing is so much fun – love the crabs and the moustaches!